Winter time, forecast in Halifax wind 15kts G25 with moderate drifting snow and a temp of -5 and vis 1/2sm (800m). NOTAMED that Glide path U/S so they set up for a LOC only. Calculated cold temp correction for FAF alt, MDA and GA alt. As the a/c descended it diverged from the desired profile due to wind variations. This divergences continued throughout the approach. PM called “minimum, lights only” as per their SOP. The aircraft was 1nm from the threshold now. At 0.7nm from threshold crew confirmed visual with the approach lights. The reports says they were over a lighted facility. At the 50ft auto callout the PM called "pull up"
TOGA was selected about 1 second before ground impact and a full, pull up, demand was made on the side stick. The left landing gear struck an approach light about 860ft before the threshold. Then the main landing gear, aft fuselage and the left engine hit the snow covered ground, bounced, took out the LOC antenna, bouncing twice more before skidding along the runway, coming to rest about 1900ft after the threshold. Power to the aircraft was lost during the ground contacts leaving only the emergency lights on in the cabin. Pax were evacuated successfully with no deaths. 1 cabin crew member was seriously injured and the were 25 minor injuries. The flight crew were pretty experienced with the Captain having over 5700 hours and the FO 6300 hours on type. CT (canadian CAA/FAA) didnt raise this as an issue at any inspections. According to the report, Air Canada pilots didnt have access to the FCOM, only the company manuals. FCOM doesnt offer any guidance on how to adjust the FPA e.g how much for how long. 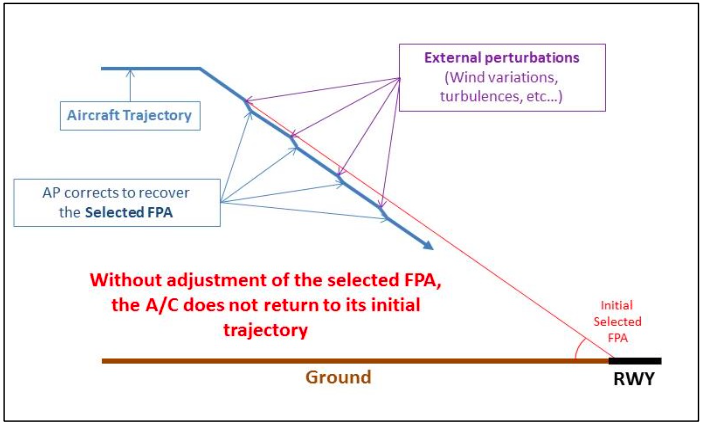 For your info, 0.1º change will affect the a/c path by 10ft over the next NM so for example if youre on a 3º glide and youre 30ft high at a height check, increasing the FPA to will get you back on profile in 1 NM. so 0.1º per 10ft. just remember to reset to 3º once its back on profile! Unlike EASA and FAA, in canade the minimum vis for an approach isnt afected by the type of ALS installed. As a comparison, for the minima at halifax the FAA would require an additional 900m of approach lighting! !